Find artworks, auction results, sale prices and pictures of Johann Friedrick Meyer at auctions worldwide. Born in Dresden in 1728, Meyer moved to Berlin in 1751 tocontinue to pursue his career as a theatre scenery and veduteartist. This painting depicts a similar low panoramic view as otherworks by the artist, such as View of the Neue Palais and Potsdam of1771, now at Sanssouci, Potsdam, near Berlin, derived from BernardoBellotto. with The Arcade Gallery, London. with Tomas Harris, London, when still together with the modello ofhalf of the cupola now in the Snite Museum, University of NotreDame, Indiana (as recorded in his photographic library). Anon. sale [The Property of a Lady], Christie's, London, 11 July1980, lot 52, as 'Ubaldo Gandolfi, possibly connected with theceiling of Palazzo Malvezzi, Bologna'. with Hazlitt, Gooden & Fox, London, where acquired by thepresent owner. D. Biagi Maino, La pittura a Bologna nel secondo Settecento, IGandolfi e l'Accademia Clementina, diss., Bologna, 1989, p. 296.Prisco Bagni, I Gandolfi. Affreschi, dipinti, bozzetti e disegni,Bologna, 1992, pp. 698-700 (pls. 673, 676 and 677). D. Biagi Maino, Gaetano Gandolfi, Turin, 1995, p. 379, nos. 129-30,figs. 149, 152. Ottawa, National Gallery of Canada, and Little Rock, ArtsCenter, Bella Pittura: The Art of the Gandolfi, catalogue by M.Cazort, 18 June - 6 September 1993, and 30 September - 28 November1993, nos. 51 and 52, illustrated. The attribution has been confirmed by Professor HelmutBrsch-Supan of Schloss Charlottenburg, Berlin. 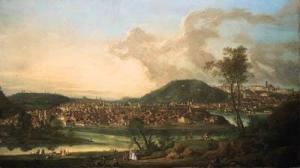 Meyer was a sceneryand view painter who studied under Johann Christian Schulz andGiuseppe Galli, called Bibiena, in his native Dresden and worked inPotsdam from 1751 until his death. The present picture can becompared to Meyer's View of the Neue Palais and Potsdam of 1771 atSanssouci in which the artist employs many of the same features:the low viewpoint, the pair of trees as a framing device in theright foreground and the use of ruined slabs bearing inscriptionswhich provide topographical information. The lowered viewpoint andthe handling of architectural detail in both pictures reveals theinfluence of Bernardo Bellotto. 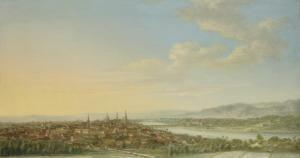 Unlike some of the earlier views of Prague which tend toconcentrate on particular sections of the city, the presentpainting is a panorama viewed from across the Vltava (Moldau)looking towards the Old and New Towns, moving upwards through theLesser town with its Baroque churches and palaces, to the castleand Gothic cathedral of St. Vitus. In the left foreground is the tip of the Stvanice Island juttingout into the Vltava. Among the many churches in the Old Towndepicted are those of Our Lady-of-the-Snows, founded by the EmperorCharles IV in 1347 to commemorate his coronation as King ofBohemia, the pinnacled towers of Our Lady-before-Tyn and St.Nicholas in the Alstad, a centralised baroque structure with domeand bell towers designed by Kiligan Ignaz Dientzenhofer. Movingnearer the Charles Bridge of 1357, with its many Baroque devotionalsculptures, there is the dome of the Church of the Knights of theCross, the tiered faade of the Jesuit Church of St. Ignatius inCharles Square and the celebrated entrance gates to the Old andLesser Towns. Climbing up the hill are the bell towers and dome ofthe church of St. Nicholas on the Kleinseite. Begun by the greatGerman architect Cristophe Dientzenhofer in 1704-11, it was onlycompleted in 1755, providing a terminus post quem for the presentpicture. To the right of the church looking into the park, is theconvex central pavilion of the Lobkowicz Palace (1703-7), now theGerman Embassy, and to the left is the bulk of the Smiricky Palacewhere the Protestant nobles met to plot the defenestration of theCatholic Habsburg officials, an act that proved to be the catalystfor the Thirty Years War. On the far right, almost out of thepicture plane but still visible, is the delicate loggia of theBelvedere of the Royal Summer Palace in the garden of PragueCastle. One of the most beautiful Renaissance buildings outsideItaly, it was built to Paolo della Stella's designs in1538-52.